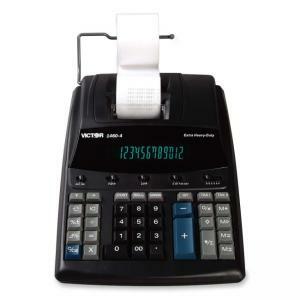 Extra Heavy-duty Printing Calculator with built-in paper arm prints 4.6 lines per second in two colors. 12-digit fluorescent display has 17mm tall display digits for easy viewing. Design also includes large, well-spaced contoured keys. Functions include two independent tax registers, four-key memory, item count, delta percent of change, grand total, sigma, date/nonadd key and subtotal key. Cost-sell-margin keys allow you to quickly and easily solve cost-sell-margin problems by entering two variables, and the third appears and prints. Calculator weighs 3 lb.